I've always been intrigued by The Brunswick Hotel & Tavern's spirit tastings, but I'd never been able to make it to one. 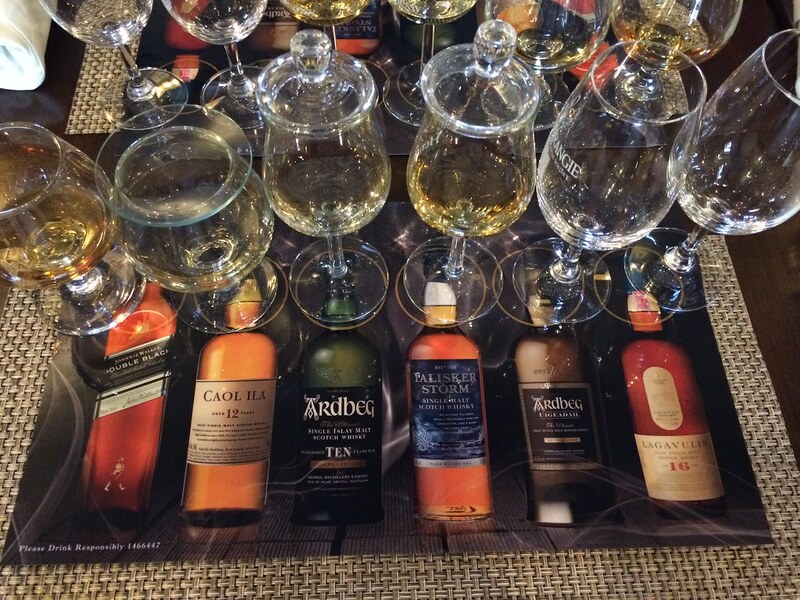 So when I was invited to their smoky Scotch tasting, I lept at the chance - maybe before the reality of the topic set in. You see, I'm not a huge Scotch fan. In fact, since starting the Portland Spirits Society, the one Scotch I've found I like is one that's distinctly un-Scotch-like (Edradour 10 year). OK, that's not entirely true, since it is Scotch and therefore by definition Scotch-like, but it's on the sweeter and less smoky end of the spectrum. More American whiskey-like. I didn't quite realize that the event was not just Scotches but smoky ones until I was seated in the cozy tavern staring down six samples of bonfire-scented booze. 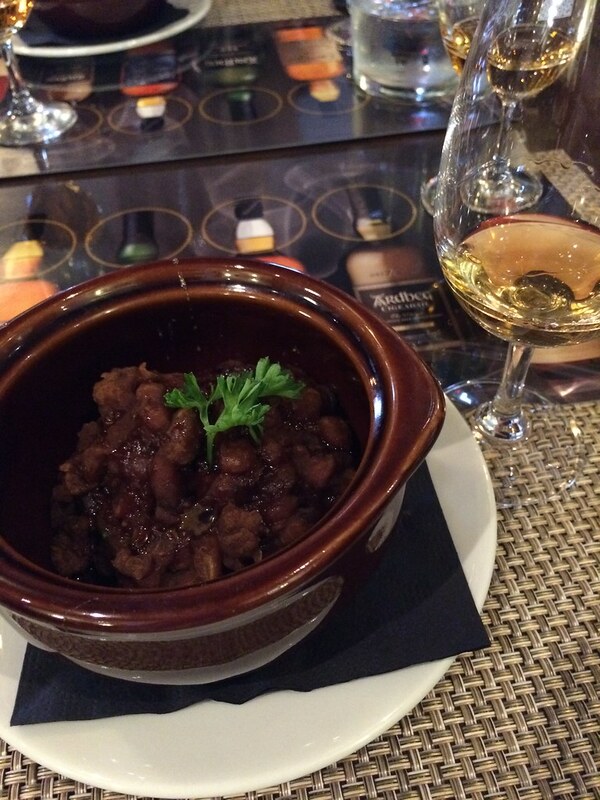 The event was led by Michael Meirs, a personable guy who reps liquor and also gives private tastings like this one. He began by introducing the ritual of tasting Scotch, from a visual inspection to a swirl to a sniff to a taste, and describing what you might encounter and what it might mean. I learned that Scotch is aged in ex-Bourbon and sherry barrels and that the color of the final product can help you tell which and therefore what to expect (i.e. yellow shades = aged in rum and reddish-brown hues mean aged in sherry casks). We began our tasting ritual with the Johnnie Walker Double Black ($39.99 for 750 mL at Maine liquor stores), a blend of 40 different whiskies, including the one we'd taste next, the Caol Ila. We observed the color, took a good sniff (neat trick: to prepare your nose, hold the whiskey to your chin and smell, then your lips and smell, then your nose and smell) and then finally tasted the stuff. Our guide didn't present us with any tasting notes, saying that they limit people by guiding them to flavors, so I don't have a lot myself either. The JW Double Black was definitely smoky, leaving the lingering flavor of cigarettes in my mouth (like I said, I'm not a Scotch fan!). 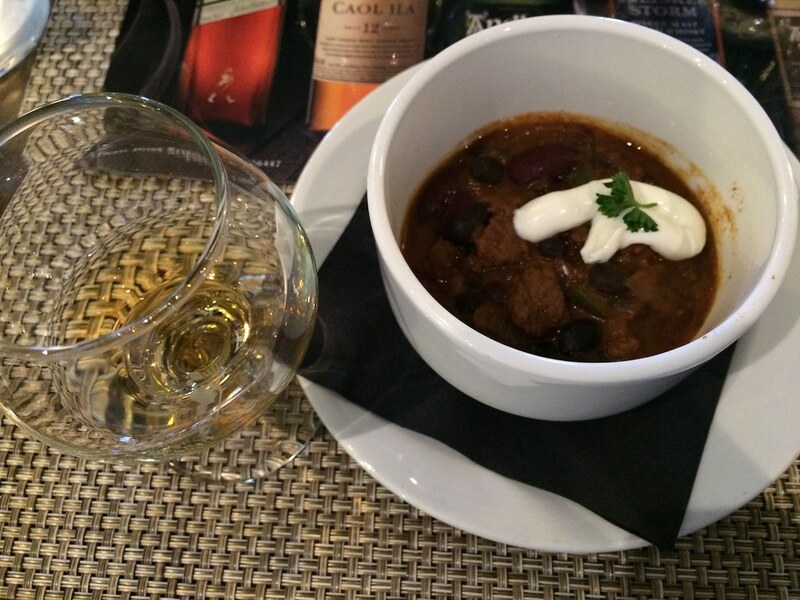 It paired nicely with the bison chili, with its big, bold flavors. The chef popped out to explain each course - in general, he said he went with big flavors to stand up to the smoky whiskies, and also worked the spirit into a lot of the dishes themselves. Next we tried one of the component parts of the Johnnie Walker, Caol Ila 12 (Maine Spirits doesn't show the 12, but lists the 18 at $79.99). The distillery is the biggest on the Island of Islay, because it's the body of Johnnie Walker, but many aren't familiar with Caol Ila. It's a single malt (meaning it's from one distillery, rather than a blended whisky). I liked this one - it was much sweeter and not as smoky, or at least the finish wasn't as long as the JW. 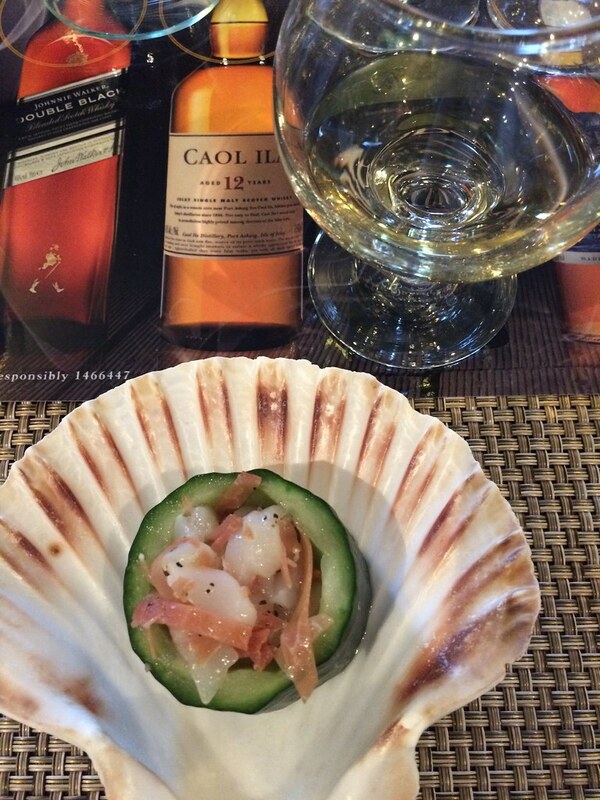 The pairing was fantastic - scallop ceviche with speck ham, nice and light, but smoky to complement the whisky. Next was our guide's favorite, Ardbeg 10 year ($49.99). He described this whisky as a "peat monster," which made me nervous. A sniff revealed the unpleasant smoky odor of plastic Band-aids. Very nervous. Sure enough: very peaty, but pleasantly fruity and floral as well. 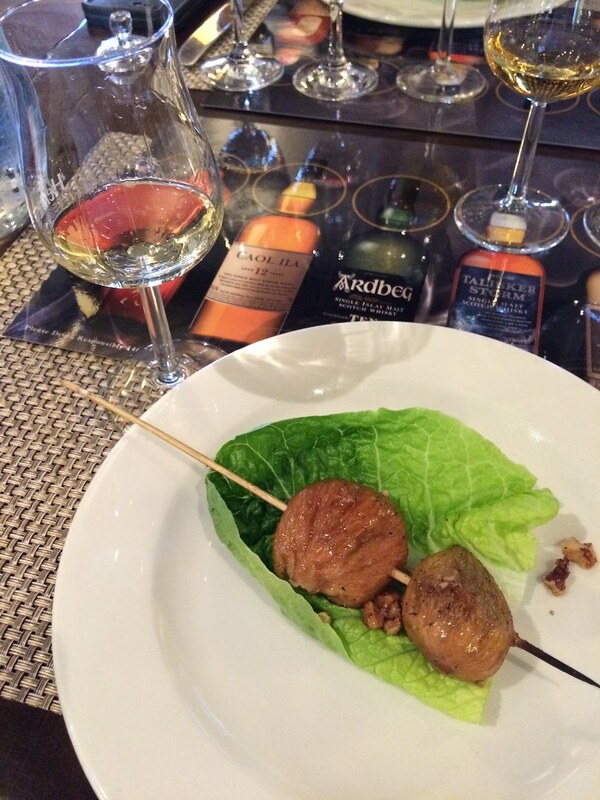 The pairing, Ardbeg-marinated grilled figs with crushed pecans and local honey, really helped to temper the smokiness. Fortunately, the smokiness flavor seemed to top out with the Ardbeg - I was genuinely afraid that the whiskies were going to get smokier from here on out. The Talisker Storm ($64.99) was up next, from the Isle of Skye, which is the most remote distillery in Scotland, but the most visited. Due to the differing terroir of the peat on the island, this whisky is less smoky, but more intense. The Talisker Storm is also aged in rejuvenated Bourbon barrels, or ones that have the char shaved off and then are recharred. The Bourbon flavor really comes through as an intense pepperiness. I very much enjoyed this one, as I felt like it bridged the gap between Scotch and Bourbon. 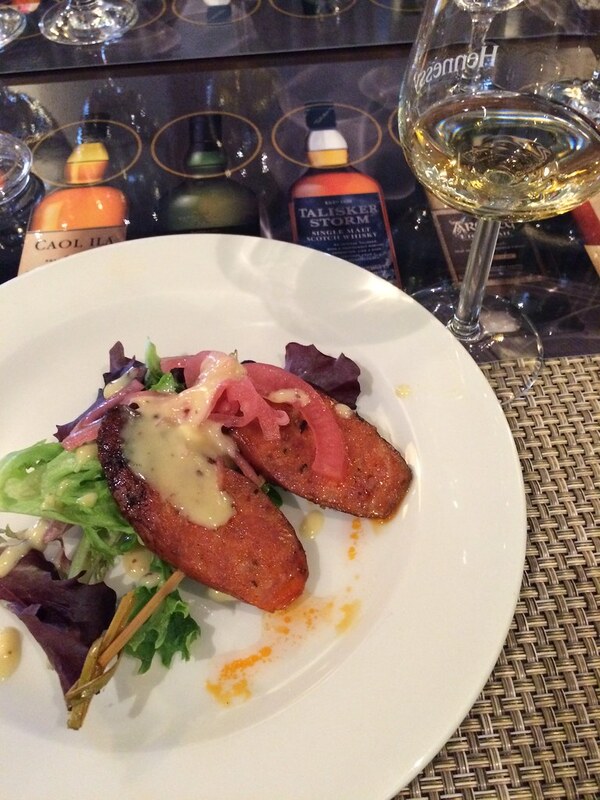 It also paired well with a spicy Andouille sausage with a Dijon mustard cream sauce and pickled red onions. If I had to pick a favorite pairing, this one would be it. Up next was another Ardbeg, this one called Uigeadail ($79.99), named after a nearby lake (I even learned how to pronounce it! ), paired with baked beans with espresso and proscuitto. This whisky is a blend of ones aged in Bourbon and sherry casks. We may or may not have cheated on this one and peeked on some tasting notes on our phones - where I learned we could expect espresso and caramel flavors, but also that this was a cask strength whisky. Meaning it was over 100 proof, and so I didn't taste much past the burning from the strong alcohol. We ended with the Lagavulin 16 ($79.99) year, which is the the longest aged flagship whisky in the industry. Our guide Mike said he thought I'd like the Lagavulin the best, being a Bourbon drinker, so I was looking forward to this one. 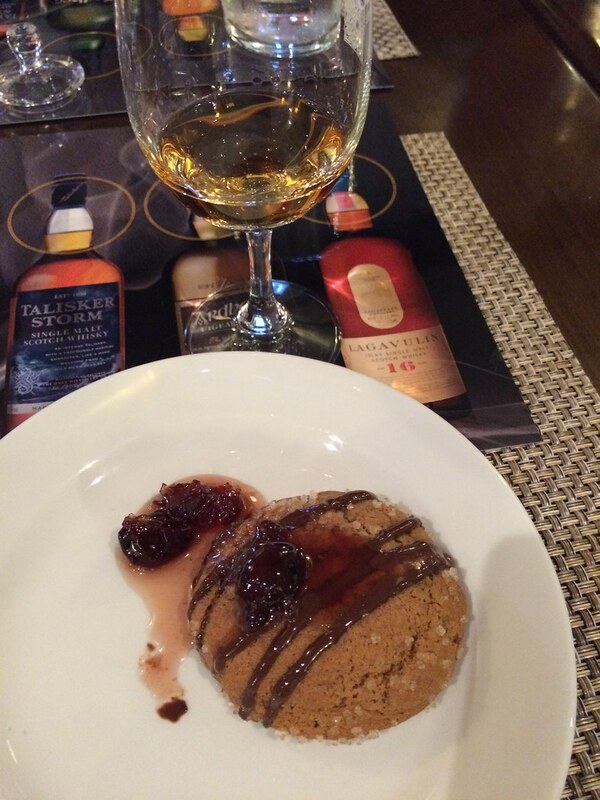 It's aged in sherry casks, so it has lots of spice and dark fruit notes, and it paired perfectly well with the warm molasses cookie and cherry compote. I'm obviously a sucker for booze tastings, but this event was well run - the speaker was personable, providing a nice mix of information about the distilleries and about Scotch in general, and the food was excellently paired with the drinks. That the chef is a Scotch enthusiast certainly helped. 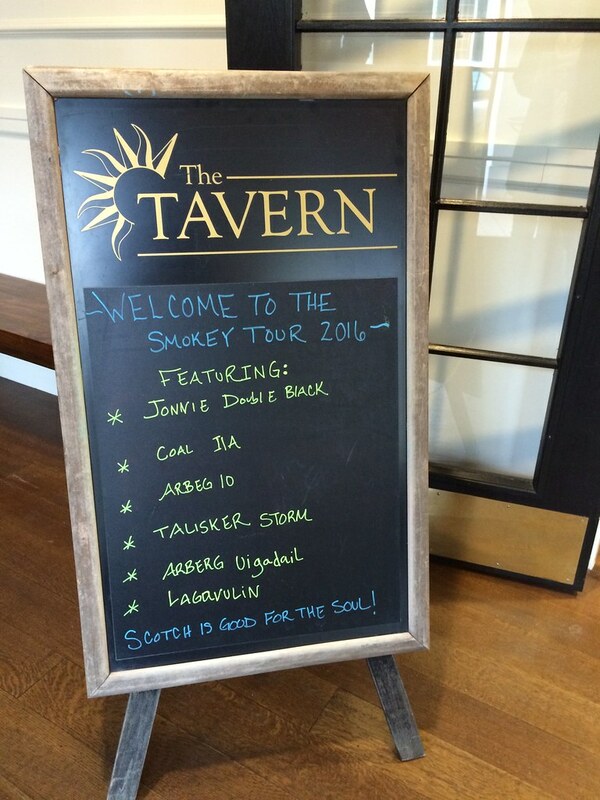 I came away from the event not necessarily a Scotch lover myself, but definitely more educated about the experience and open to learning more about the smoky spirit. 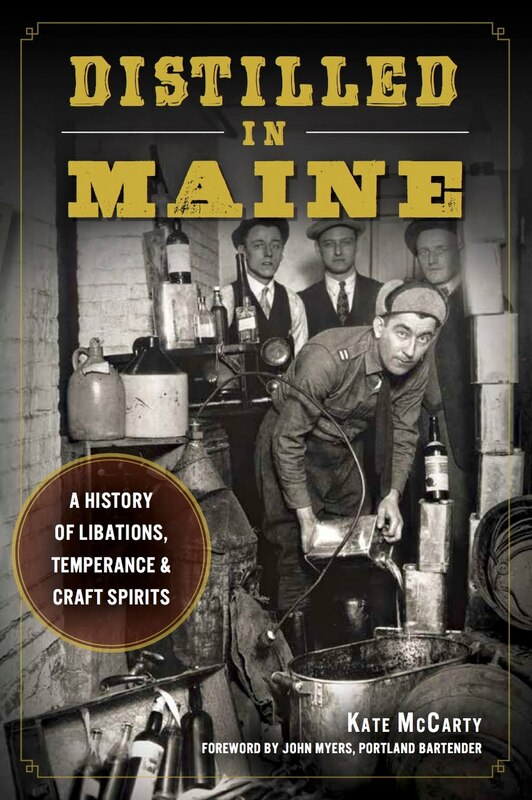 Check out the Brunswick Hotel & Tavern's next spirits tasting (they're offered periodically, although one is not scheduled now) or check them out during Maine Restaurant Week for lunch or dinner, March 1st-12th. I attended this event for free as a guest of the PR firm that represents the hotel, however, the words and opinions expressed in this post are mine. Drifter's Wife, a bar in the front of the wine shop Maine & Loire, opened last night, just in time for us to huddle up in the cozy space as a Nor'easter passed through. 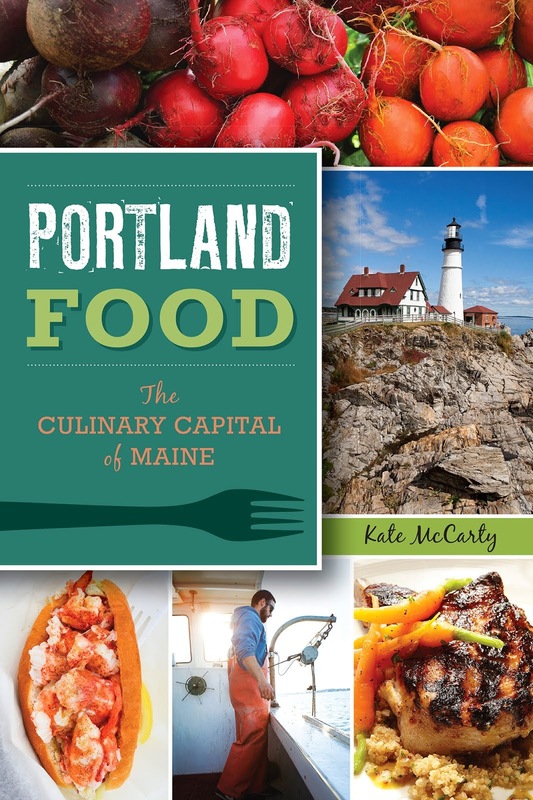 Maine & Loire sells a selection of natural wine, which the owners define as wine "farmed without chemicals, harvested by hand, made with native yeasts, and minimal interventions." 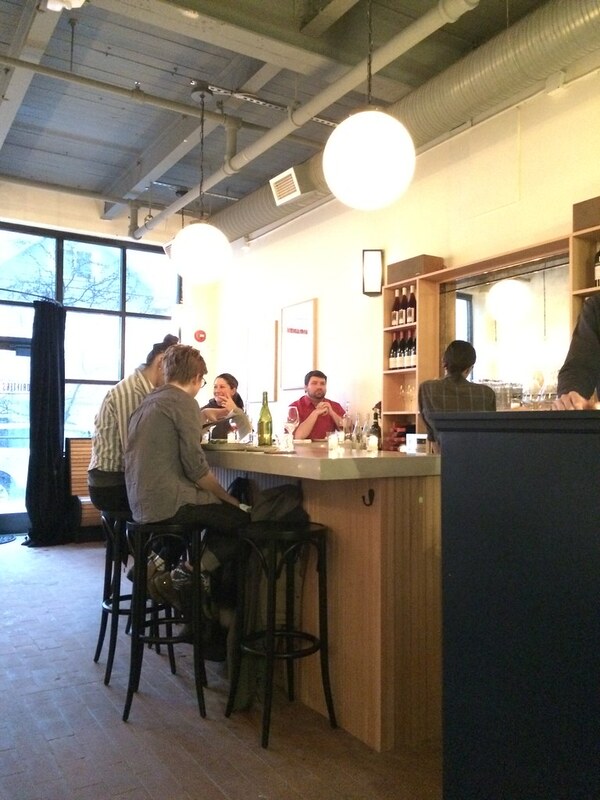 The owners, Peter and Orenda, have always been very helpful picking out wine in their shop, but their new wine bar lets you try new-to-you wines. It's also a lovely place to hang out and spend time with friends. If you visited the shop before the addition of the bar, then you know it was a large warehouse-esque space with racking along the walls. No frills. Now the space is divided in half, with a small bar near the front and a few booths and cafe-style tables surrounding it. A metal partition separates the tables from an aisle that leads back to the wine shop. It's a nice transition of the space. 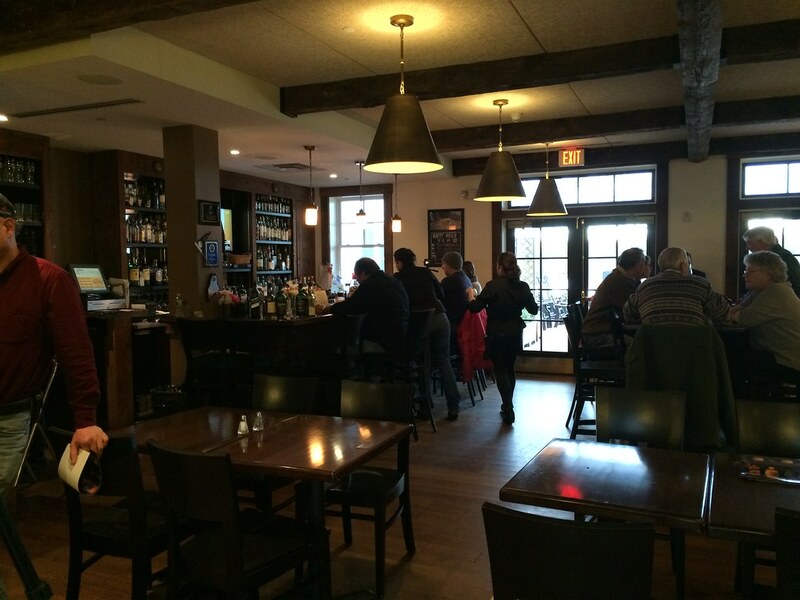 The wine menu offers several whites and reds by the glass and a larger bottle list. 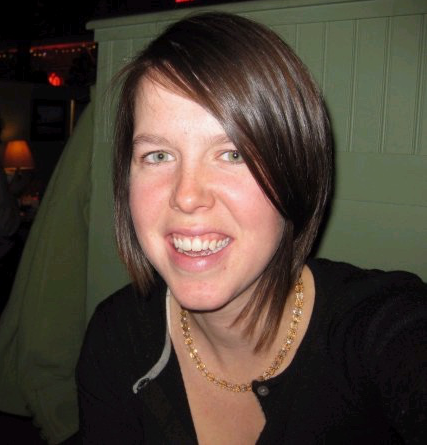 I chose a sparkling wine ($10), while Original Roomie A. went with a muscadet. In a place like Drifter's Wife, you don't have to worry about sweet, garbage-y wine; while muscadet can be very sweet, this one was pleasantly dry with warm spice notes. There's a small menu of snacks like chicken liver, a cheese plate, and a plate of winter radishes. 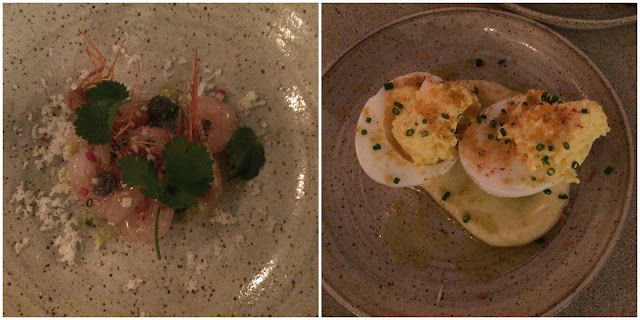 We sampled some warm olives, the "egg" or deviled eggs topped with bottarga and sitting on a smear of mayonnaise, and raw Maine shrimp with fried heads, topped with horseradish. Both were a delicious and light accompaniment to the wine. 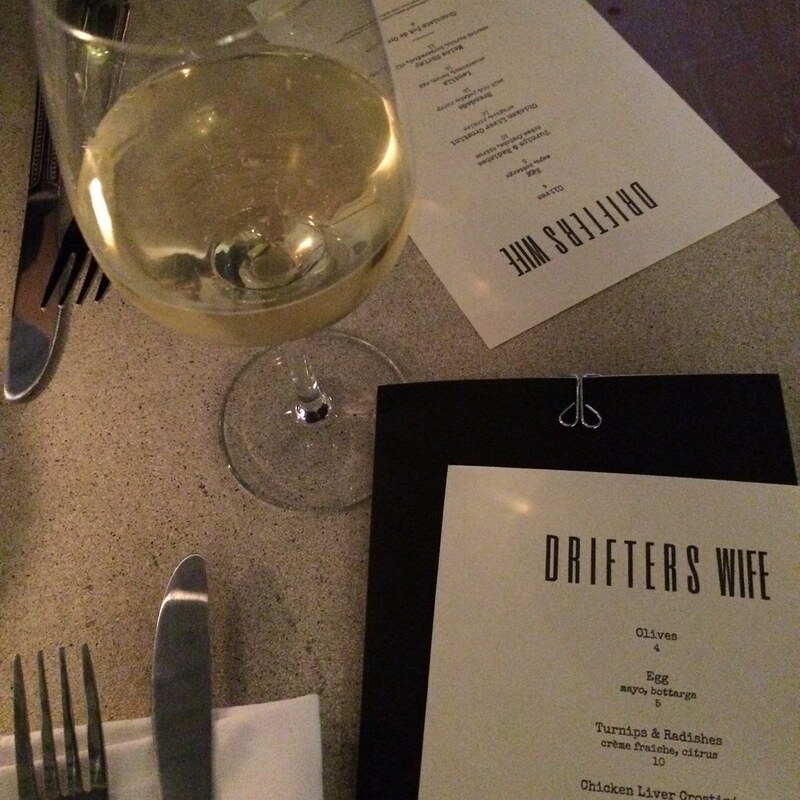 Stop by the Drifter's Wife at 63 Washington Avenue for a glass of natural wine after 4PM, every day except Sundays (the wine shop is open 7 days a week). Ed. note: Rhum has closed. 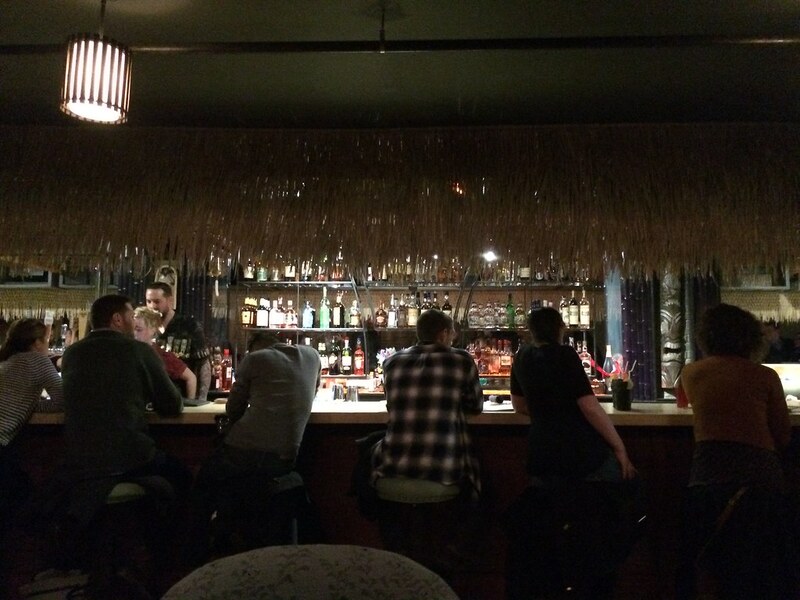 The long-awaited opening of the tiki bar Rhum is finally here. Hallelujah! While we've had a mild winter so far, it's still a much needed oasis that will help to mediate your seasonal affective disorder. Rhum is located under Arabica Coffee on Spring St. next to Styxx (technically 4 Free St. for your Uber driver). The lounge is set back off the street a bit and has a black front, so it could be easy to miss. Once you're inside, it's pretty dark (there's no windows), which creates a cozy and mysterious vibe. That, combined with some strong rum drinks, means you could lose many hours in here. I've already been twice, and each time I had to get the painkiller (shown above, right). It's delicious and goes down way too easy. 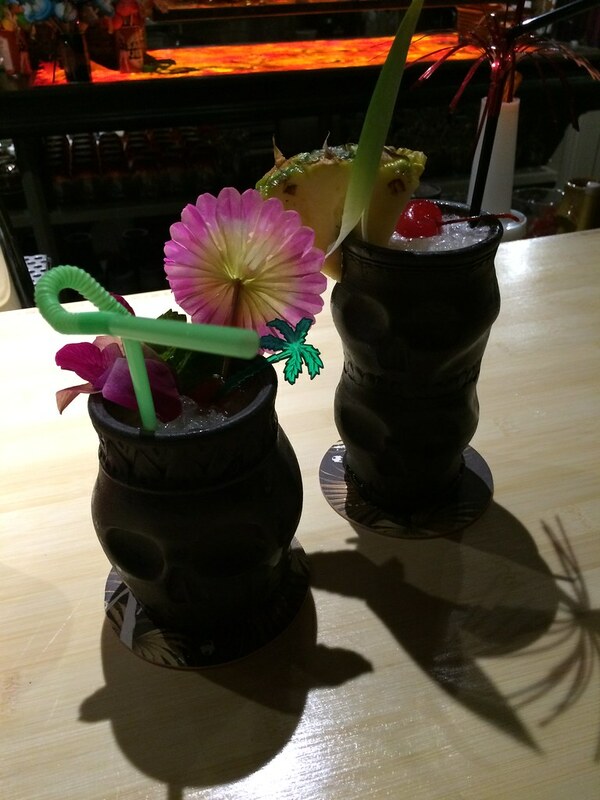 The tiki drink menu includes classics like the mai tai, fogcutter, rum runner, and junglebird, all served in ceramic skull mugs (made by a local Portland artist) and decked out with fruit and sparkling garnish. The long narrow space is filled with a U-shaped bar, adorned with grass. Along one wall is high, communal tables and along the other, a winding banquette with club chairs and small tables creating cozy nooks to gather. The kitchen is Frank Anderson and Rebecca Ambrosi, chefs who have run a local supper club, as well as one in L.A., with help from Fred Eliot, formerly of Petite Jacqueline. 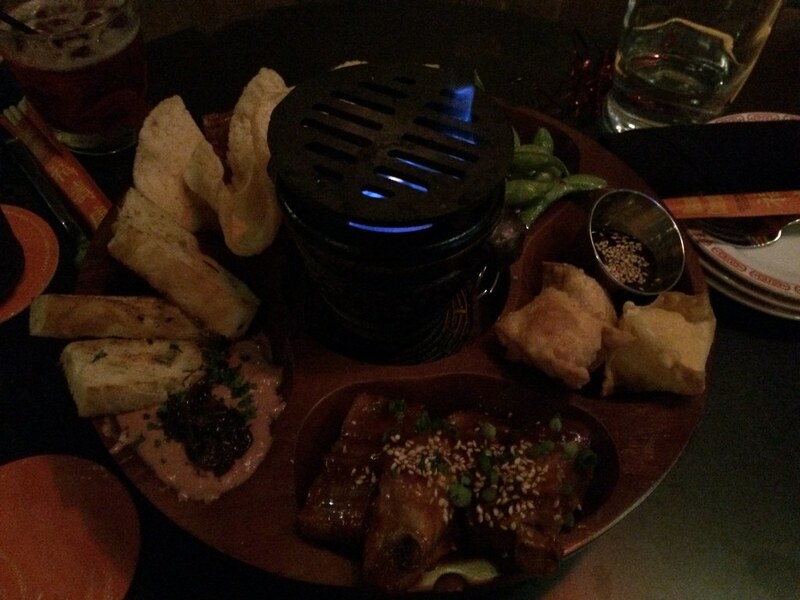 I tried the pupu platter (market price - $18 that night) to sample a few things at once: crab rangoon, edamame, prawn crackers, housemade jerky, chicken liver patê with tamarind chutney, and short riblets. It came in a vintage rotating wooden tray with a festive sterno in the middle. I loved everything on the sampler and heard raves about other menu items like the hiramasa poké and the kaya toast (with coconut jam and a soft-boiled egg). Head over to Rhum as soon as you can for some strong drinks and some updated Polynesian fare - it's open 7 days a week at 4p.m. (kitchen opens at 5). 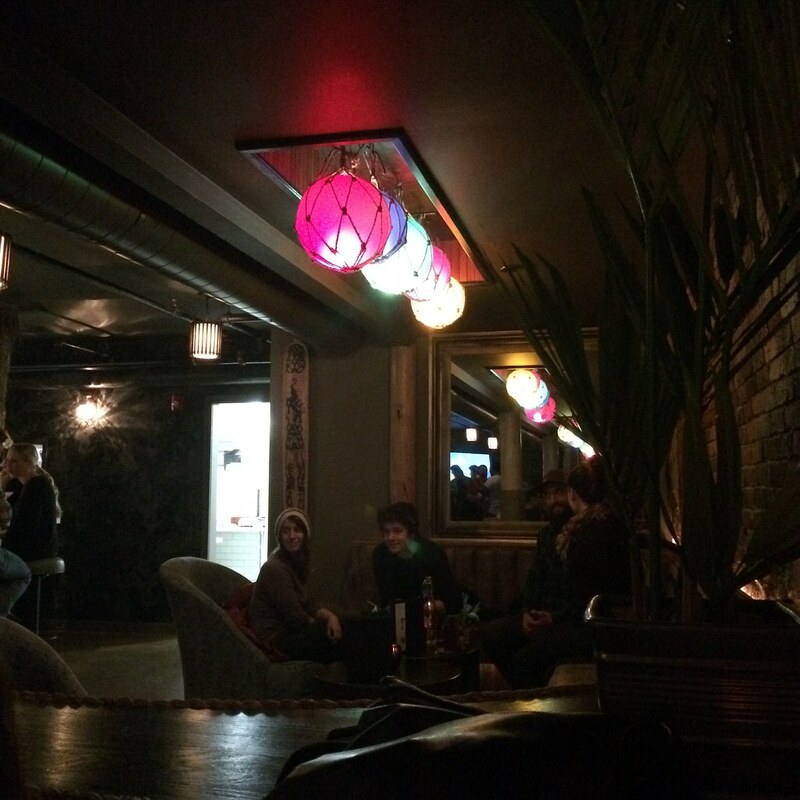 It's what Portland has been missing - a lounge full of escapism with an air of mystery. It's the perfect place to sip on some rum until beach weather returns.